The Great Showman's Motto Was: "Without Promotion Something Terrible Happens: Nothing!" 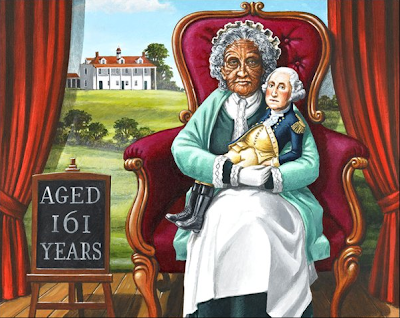 Banner Created by Mark Coleman for The National Fairground Archive Exhibit: Humbug! Celebrating 200 Years Of P.T. Barnum. As journalist H.L Mencken famously said: "No one ever went broke underestimating the taste of the American public." He could have added; "And no one knew that better than P.T. Barnum." This year marks the 200th anniversary of the birth of Barnum, who became the first show biz millionaire by catering to the flip side of the public's attraction to the beautiful. Barnum knew that in a repressive society like that of the Victorian era, humanity's shamefully unacceptable craving for the eccentric, the strange, the bizarre, and the downright freakish had been starved for far too long. The people's thirst for comeliness had been quenched, but somebody had to satisfy society's hunger for homeliness. A new British exhibit sponsored by The University Of Sheffield's Western Bank Library and National Fairground Archive (NFA) celebrates the showman who won over the world, and even made a fan of Queen Victoria, by letting his freak flag fly. P.T. Barnum's American Museum, located 1841-1865, at the corner of Broadway and Ann Street in lower Manhattan, combined sensational sideshow attractions with earnest attempts at educational and moral uplift. When a raging fire destroyed the American Museum on July 13, 1865, some citizens lamented its loss while others cheered. Barnum quickly re-opened the American Museum at a different location, but it too burned to the ground in 1868. The exhibit, Humbug! Celebrating 200 Years of P.T Barnum, showcases original posters, handbills, and memorabilia used by the famed entertainer to promote his shows over 100 years ago. It celebrates the trickster who took America and England by storm with his collection of real and invented freakish attractions. The curator of the exhibit, Professor Vanessa Toulmin, Director of the NFA, is pleased to have the chance to show off many one-of-a-kind items from her collection: "The archive material on display is usually all in boxes behind the scenes, so it's a fantastic opportunity to see around 100 items from the depths of our archive." When asked to explain the magic of Barnum she replies: "He's probably the world's greatest showman. He created what we know today as PR/marketing and showmanship. Everything I've ever thought of, he did it!" Jumbo the Elephant was born in 1861 in the French Sudan. He was bought by the Paris Zoo, and transferred to the London Zoo in 1865. The gentle giant was much loved for giving rides on his back to children who visited him. Jumbo was sold to P.T. Barnum in 1882 for $10,000. 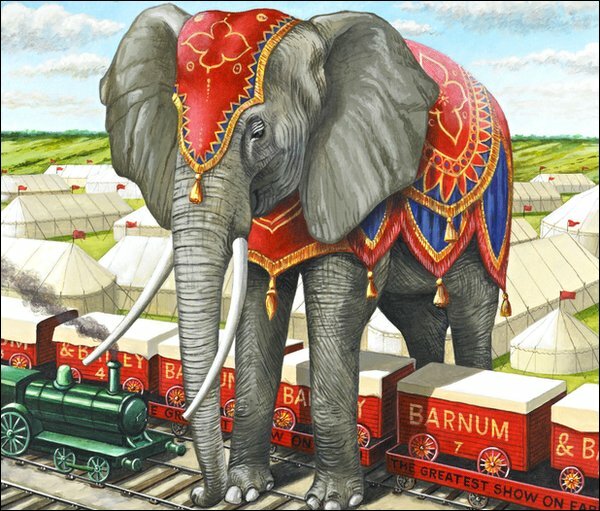 (When it was learned Barnum planned to transport the elephant to America, 100,000 school children wrote to Queen Victoria in protest.) Jumbo died at a train crossing in St. Thomas, Ontario when he was crushed by a locomotive. Barnum later claimed Jumbo died a hero's death, trying to save a baby elephant from harm. 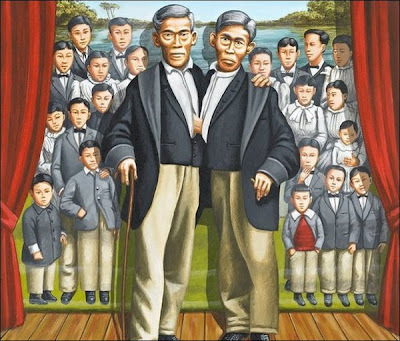 Chang and Eng Bunker, Barnum's famous Siamese Twins, were joined at the sternum and shared a larger than normal liver. Born in 1811 in Siam (now Thailand) they arrived in the United States in 1829. 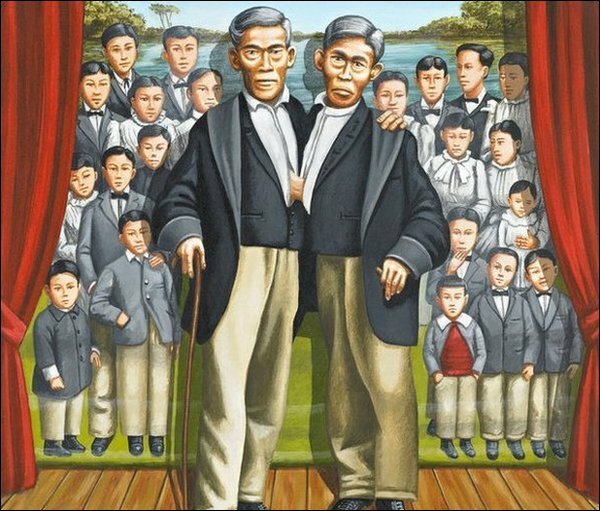 At age forty-two, Chang and Eng married sisters Addie and Sally Yates, and they fathered twenty-one children. The two died on the same day, three hours apart. The fused liver of the Bunker brothers was preserved and is currently on display at the Mutter Museum in Philadelphia. Professor Toulmin wanted Humbug! to be a fitting tribute to Barnum, so she commissioned two artists to jazz up and modernize the exhibit by creating original artwork inspired by the master showman's sizzle, pizazz, and razzle-dazzle. 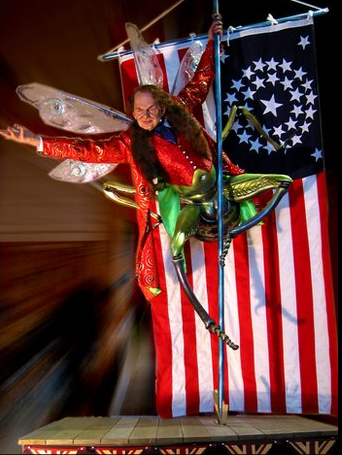 Sheffield sculptor Anthony Bennett created a ten foot statue of Barnum for the show, and artist Mark Copeland of the Insect Circus Museum painted ten cloth banners, each ten feet high, commemorating some of Barnum's star attractions and key aspects of his career in show business. Anthony Bennett's Oversize Sculpture of Barnum, Specially Commissioned by The National Fairground Archive. Bennett's sculpture took four months to create, not counting a significant amount of time for research. He was impressed not only with Barnum's theatricality, but also with his anti-slavery views in the Civil War era. He found it both ironic and admirable that Barnum worked to expose the fraudulent psychics and medical charlatans of the time, who took advantage of the poor and uneducated. Bennett explains his half human/half insect take on Barnum this way: "As you will see in the sculpture Barnum has got cricket's legs. It's a reference to Pinocchio. Jiminy Cricket was the moral guardian for Pinocchio and I wanted to put that across with Barnum. I wanted to have fun with the transformation and create something almost in a comic book style. I didn't want to create something really serious, but have fun and entertain as well as inform." Mark Coleman's (very) idealized take on Barnum's Bathing Beauty. 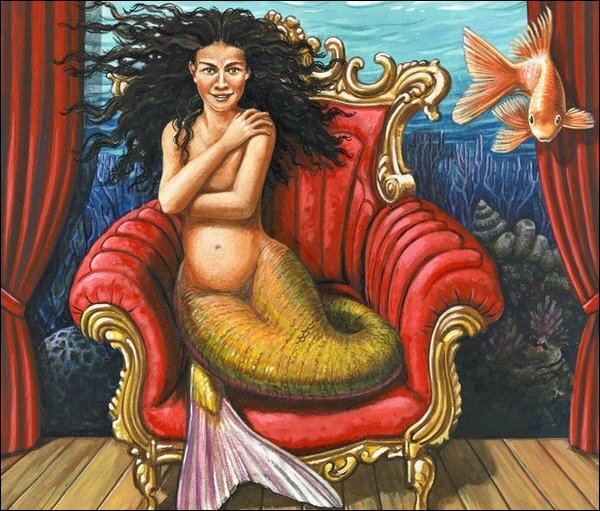 Before exhibiting his "mermaid" in 1842, Barnum created a media frenzy by claiming that: "Dr. Griffin, agent of the Lyceum of Natural History in London" would be visiting New York with a "veritable mermaid taken among the Feejee Islands." ("Dr. Griffin" was Barnum's friend Levi Lyman.) The creature was really the upper torso of a monkey sewn to the lower half of a fish. It was one of Barnum's biggest attractions during his first year in show biz. Barnum claimed former slave Joice Heth was 161 years old, and had been a nanny to George Washington. Upon her death, Barnum had an autopsy performed to prove her age. When the doctor determined Heth had died at 80, Barnum claimed it was the wrong body, and swore that "the real Joice Heth is on tour." Painter Mark Copeland's ten canvas banners celebrate such Barnum stalwarts as The FeeJee Mermaid, General Tom Thumb, Chang and Eng The Siamese Twins, Madame Josephine Clofullia The Bearded Lady, and William Henry Johnson AKA Zip AKA What Is It? Copeland has a great affection for the letterpress posters used to advertise Victorian traveling side shows: "I always loved the nonsense that was written on them. The way they're worded, particularly the old ones: you sort of promise more than you deliver in a lot of ways, and that's fine." His banners for Humbug! bear that same bombastic braggadocio. Josephine Boisdechene had a two-inch beard at age seven. She eventually married a French painter, changed her billing to "Madame Josephine Clofullia," and had two children. 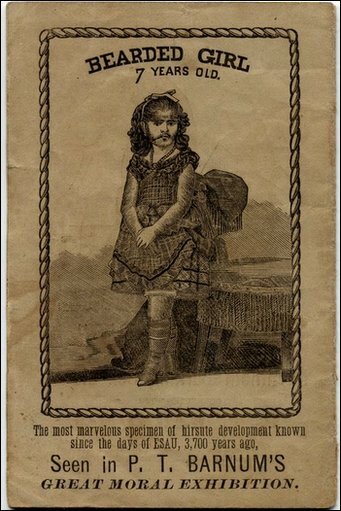 A museum customer, William Charr, sued her in 1853 claiming she was actually a man. Barnum, her husband, her father, and various physicians all testified she was biologically female, and the case was dismissed. The publicity made The Bearded Lady more popular than ever. She always appeared in public beautifully dressed in the latest Victorian feminine fashions. In addition to the fearlessly flashy art, and the never-before-seen archival material, Humbug! has one more trick up its sleeve to guarantee delivery of the frills, chills, and thrills that the greatest showman on earth deserves. Curator Vanessa Toulmin leads a secret life as a circus showgirl: "My family are O'Connors, and they're from a Travelling tradition. My great-grandmother was from an English show family and she and my great-grandfather set up the O'Connor Fair, which has been running...for 70 years. I've been backwards and forwards to Ireland many times. I have family in Ireland who are Travellers. I've been thrown out of pubs there for being a Traveller." 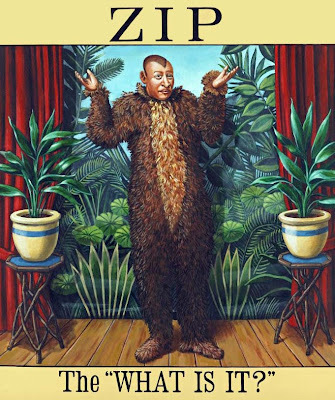 William Henry Johnson, a microcephalic man given a pointy haircut, was dressed by Barnum in a furry suit to play the role of the missing link between ape and man. His 40 year career rattling the bars of his "cage" and yammering in gibberish was quite lucrative. When uncaged, he lived in a Connecticut mansion that was a gift from Barnum. On his deathbed Johnson turned to Barnum and said: "Well, we fooled 'em for a long time, didn't we?" 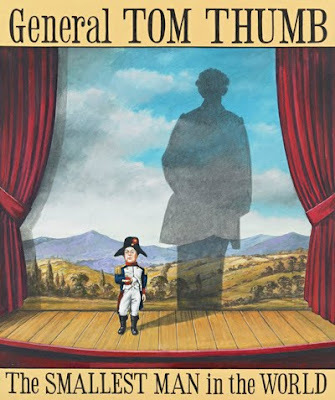 The three foot, 4 inch tall General Tom Thumb, born Charles Sherwood Stratton, was a distant relative of Barnum's. Stratton and Barnum began to work together when the boy was only four years of age. He was given singing, acting, and dancing lessons, and toured America by the time he was five. A year later, in 1844, he appeared before Queen Victoria and played with the three-year-old Prince of Wales, the future King Edward VII. Tom Thumb married Lavinia Warren, also a midget, in 1863. Barnum's advertisements often depicted the couple with a child although they had no children. Toulmin debuted an earlier version of the Humbug! at Blackpool's annual celebration of fairground, circuses, sideshows, and freak shows: Showzam! Interviewed at that fun-filled locale, the Professor revealed her saucy side: "When I was a child I wanted to leave the fair and run away to university. Here I'm a showgirl . When I go back to Sheffield I will have to be an academic again. My colleagues think I have a split personality." 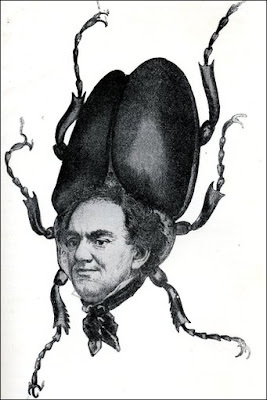 A Newspaper Caricature of Barnum Done During His Lifetime. So step right up to the Western Bank Library between March 5 and May 27, 2010 and behold: Ancient and authentic artifacts of a bygone age! Larger-than-life-size likenesses of the strangest sideshow attractions the world has ever known! The amazing and mysterious half-man half-beast effigy of the showman who charmed the crowned heads of Europe! And for a special limited engagement: (Just returned from the bestial badlands of Blackpool!) The One and Only Venus Vanessa, Scholarly Showgirl of Sheffield! The Circus World at Baraboo has a lot of information on Barnum.